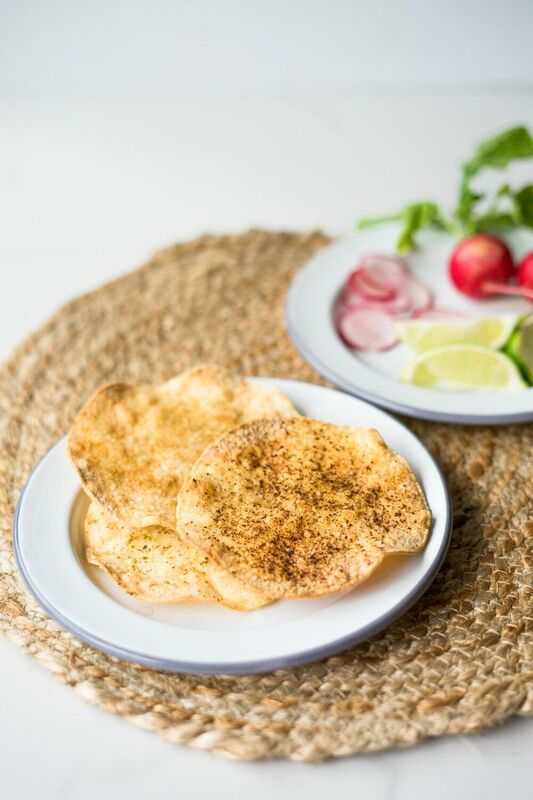 This baked crisp tostada shell recipe is an easy way to make the base for tostadas or taco salads in the oven. Instead of frying flour or corn tortillas, they are baked so they are better for you and easier to make too. You do have to keep an eye on the tortillas as they bake because you don't want them to get too brown or burn. Use these shells for the obvious—tostadas—but also for serving a Tex-Mex-style salad. Pile in some greens, avocados, and cubes of Pepper Jack cheese, then top with a ranch salad dressing made with minced jalapeños and diced red pepper. Brush the tortillas lightly with the oil using a pastry brush. Place the tortillas in a single layer on two cookie sheets and sprinkle with salt and/or chili powder, if desired. You also can sprinkle them with optional spices like cayenne pepper, cumin seed, or cumin powder or fresh herbs like oregano or cilantro. Bake the tortillas for 5 minutes, then turn the tortillas using spatulas or tongs, rearrange the cookie sheets, and bake for 3 to 6 minutes longer until the tortillas are crisp and light brown. Use right away or store for later use. The shells store well. Just put them in a hard-sided container and keep at room temperature up to three days. For longer storage, you can freeze them up to three months. When ready to use, let them thaw at room temperature. If the shells are no longer crisp, heat them in a 400 F oven for a few minutes and they will be as crisp as the day you baked them.